Last edited by kelsfine69; 07-18-2009 at 10:58 PM. "You can take the man out of PA, but you can't take PA out of the man"
Last edited by HeavyD; 12-28-2014 at 12:21 PM. Just trying to learn what it all means? some day gadget some day!! c42 is for the heater... I'll assume you have a 67. 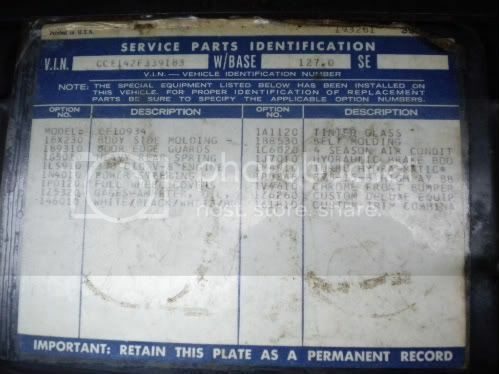 In 67 the heater, while standard (first year for that) the dealer was told to treat it like an option. If the heater was not requested, then it was a credit to buyer. I don't think they always put every option on the spid. I have seen a lot of options that that looked to be original but were not listed. Anyone have any further info on such? What kind of parts are you talking about? The assembly line was supposed to list every option on the SPID ad build sheet. It didn't always happen, but they were usually fairly acurate. The parts you are seeing may be part of an option package, or a dealer installed accesory. Heres one you dont see every day. 1968 Chevrolet C20 Longhorn "Cool Truck"
Here is my SPID from my 72 GMC Super Custom built in Oshawa. I notice the font type is a little different from the rest on this thread. Also note that Tachometer is spelled wrong (TACHOMATER). 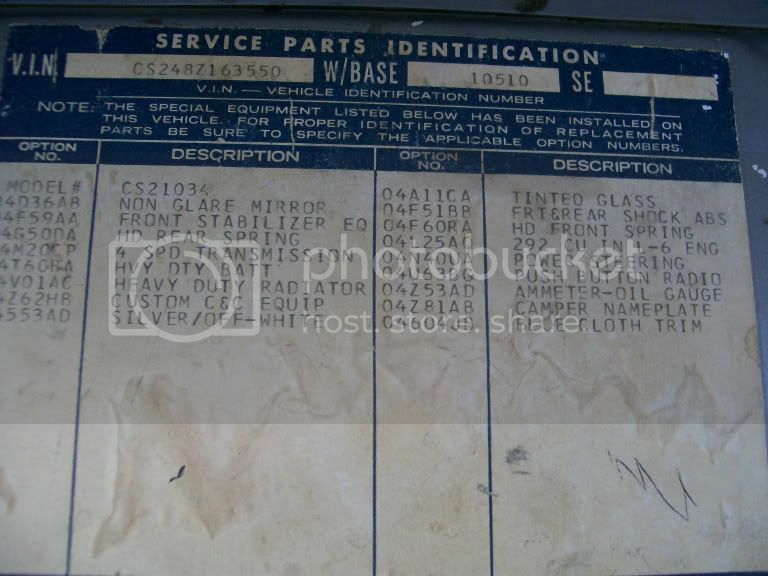 I think its original as GM Canada Vintage Vehicle Services has confirmed the options it was built with are the same as listed on this SPID. Any body else with this style of type on your SPID? Last edited by leh72super1500; 10-27-2009 at 12:17 AM. Ive got one I haven't seen here yet. I'll post it tomorrow. Leh72 is the Hawaiian blue color supposed to listed as such? I always thought it was more of a nickname and the factory listed it as med blue on the SPIDs..of course I could be wrong. All the trucks I have owned had the regular font type. leh72super1500, my 1968 Longhorn spid has the same spid font as yours. I will post a picture tomorrow. Last edited by OregonC20; 10-27-2009 at 01:40 AM. '67 SWB Fleetside ZZ4/350/Tremec 5-speed/4link/Scott's IFS - and fun as heck! "The best high is the Most High!" Here is mine, nothing special. 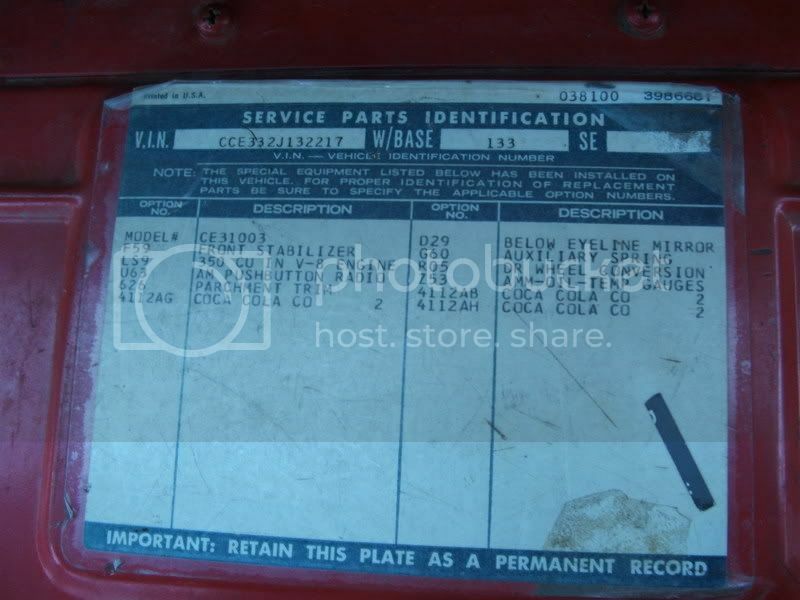 Attn Longhorn: Pic 8 on page 1 has a different code for aux fuel tank. NL2 versus N18 from chips site. Could it be due to the 133" wheelbase? 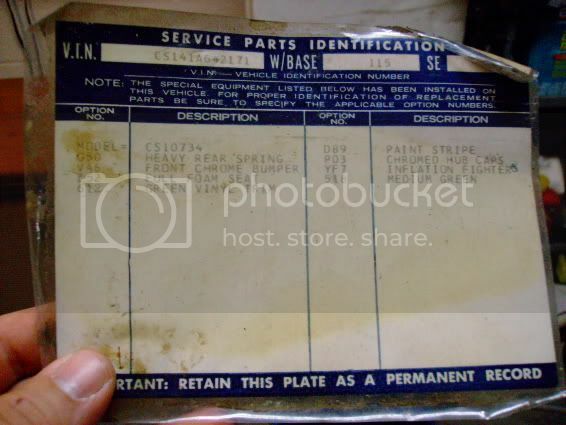 Also, am looking for a RPO code for Brush/Grilleguard. Or how about spotlights? Here is my LOADED SPID - almost completely obscured by the POs horrific paintjob overspray. Last edited by czarcaustic; 10-27-2009 at 12:26 PM. Bruce the N18 was an error on my part, it is supposed to be NL2 and has been corrected on the page. No idea on the brush/grilleguard. I'm not a pessimist, I'm just optimistic that bad things are going to happen. 1971 Cheyenne Super K10 - tilt, cruise, air, am/fm, tow hooks, factory buckets! 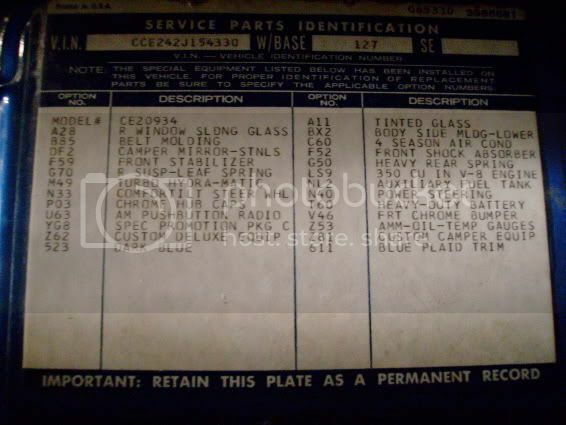 1986 Jeep J10 pickup, - 5.3L Vortec with 4L60e and NP241. Heres the one on my stepper. It started out as a 3/4 ton Custom Camper. You couldn't tell by looking at it now. Last edited by 70c10-08; 10-27-2009 at 09:28 PM. HeavyD, according to the Interior and Exterior color charts that GM sent me the option code 481 is the "Hawaiian Blue" / White "Western" two tone combination. The 72 sales brochure also calls it Hawaiian Blue. However I also have seen it reffered to Medium Blue. I find there is not too much consistency in the description of the options on the SPIDs. With mine it looks like the SPID machine broke that day and they had to type it by hand, mis-spellings and all.